A new study suggests that some stars in the Milky Way may contain giant terrestrial planets that contain up to 50 percent diamond. 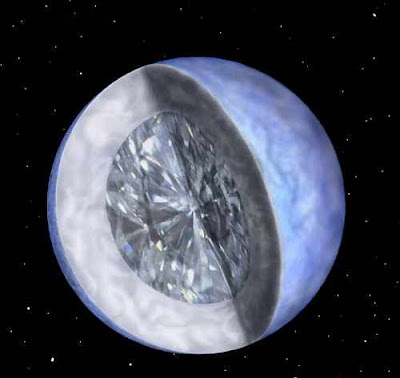 The diamond planet may be five times the size of Earth and weighs as much as Jupiter. Wendy Panero, associate professor in the School of Earth Sciences at Ohio State, and doctoral student Cayman Unterborn constructed computer models of the minerals that form in planets composed with more carbon than Earth. These "carbon super-Earths" may not be able to sustain life though. A carbon super-Earth's interior would quickly freeze since diamonds transfer heat readily. This would mean that the planet has no geothermal energy, no plate tectonics, and no magnetic field or atmosphere. On a related note, astronomers in Australia have reported discovering a Diamond Planet orbiting a pulsar. Watch the two videos. Geologist have verified what they long have suspected; that the a layer of diamonds likely exists in the Earth's lower mantle, just above the core. Based on the result, a further model was constructed to see what would happen to the composition of a carbon super-Earth with the same conditions. What they found was that the planet could become very large, with iron and carbon merged to form a kind of carbon steel in the core, and vast quantities of pure carbon in the mantle in the form of diamond. The researchers discussed the implications for planetary science. "We're looking at how volatile elements like hydrogen and carbon interact inside the Earth, because when they bond with oxygen, you get atmospheres, you get oceans – you get life," Panero said. "The ultimate goal is to compile a suite of conditions that are necessary for an ocean to form on a planet."